The Liberty 5 in. 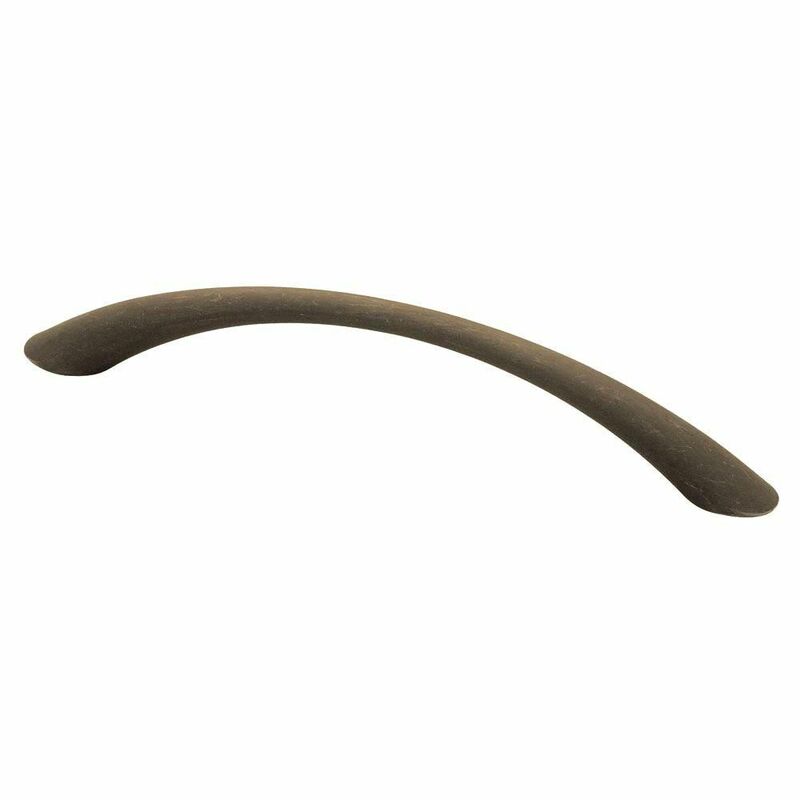 Distressed Oil-Rubbed Bronze Tapered Bow Pull offers a clean look for your cabinetry. Complement your life with style. The pull installs easily with an 8-32 x 1 in. machine screw (included) for your convenience. Amerock's wide variety of finishes, styles and sizes for all decorating tastes is the inspiration for the beautiful designs. Showcasing decorative hardware solutions that inspire, coordinate throughout the home and express personal style, Amerock Decorative Hardware is the perfect finishing touch for all rooms around the home. Use this collection to complement your space, from utilitarian to contemporary. Use the Liberty 3-1/2 in. Oil-Rubbed Bronze Rustique Ringed Rigid Pull to decorate existing cabinets for a fresh look in oil-rubbed bronze. The included hardware makes installation a breeze. Ideal for use as an accent for kitchen or bathroom cabinetry or furniture. The Liberty 3-1/2 in. Dark Oil-Rubbed Bronze Wire Pull is constructed of durable metal material to help provide long-lasting use. Update your hardware to give the room a new look and feel. Includes a polybag with an 8-32 in. x 1 in. machine screw for easy installation. The Artesia Collection of cabinet hardware offers the perfect transition to modern design hardware. Make a statement with updated hardware for your home décor. Ideal for both kitchens and bathrooms. 128mm Enchanted Pull The Liberty 5 in. Distressed Oil-Rubbed Bronze Tapered Bow Pull offers a clean look for your cabinetry. Complement your life with style. The pull installs easily with an 8-32 x 1 in. machine screw (included) for your convenience. 128mm Enchanted Pull is rated 4.7 out of 5 by 50. Rated 5 out of 5 by Sheri from Nice solid pull. Nice solid pull. Rated 4 out of 5 by ck from These pulls are very nice. I have them throughout my kitchen. The pull looks wider to me in the... These pulls are very nice. I have them throughout my kitchen. The pull looks wider to me in the picture than they actually are. They will work in my bathroom but I really wanted something heavier looking. Rated 5 out of 5 by Joesph from Very nice stuff.... Very nice stuff. Rated 4 out of 5 by pm from The handles are what I expected. Look great.... The handles are what I expected. Look great.